I have many singles by Chris Rea. The man is a solid songwriter and his singles rarely disappoint. Bewilderingly, there's never been a complete singles collection of the man's output. I once made one myself, but this was in the days before Discogs and Wikipedia, so the 2 CDR set I made was not complete. 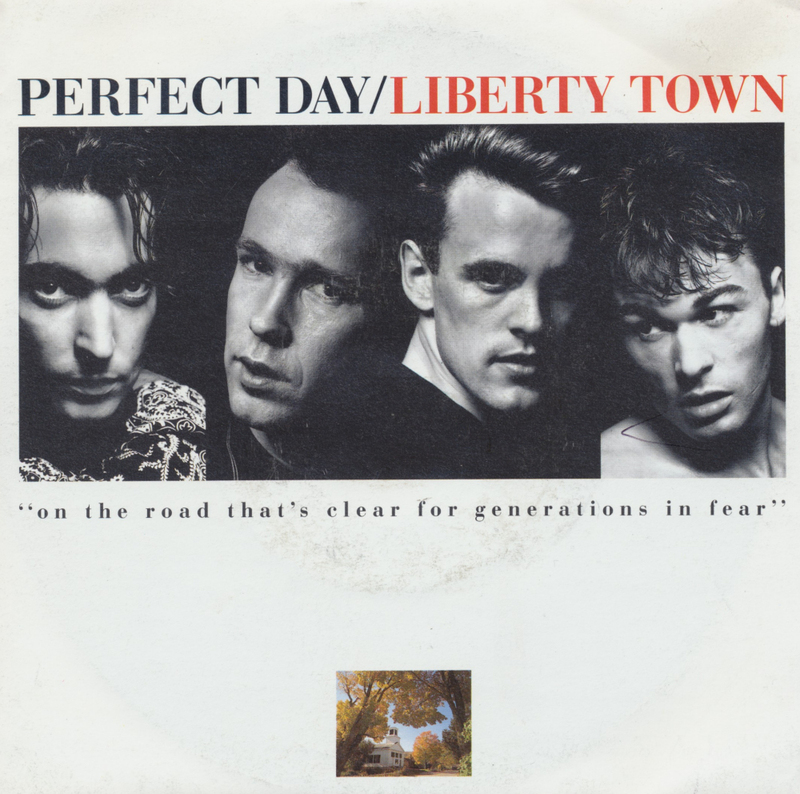 After the single Jane, Perfect Day released 'Liberty town', a track produced by Ricky Wilde. I managed to find this single during last Saturday's record fair in Utrecht, not long after finding 'Jane' with the same dealer. 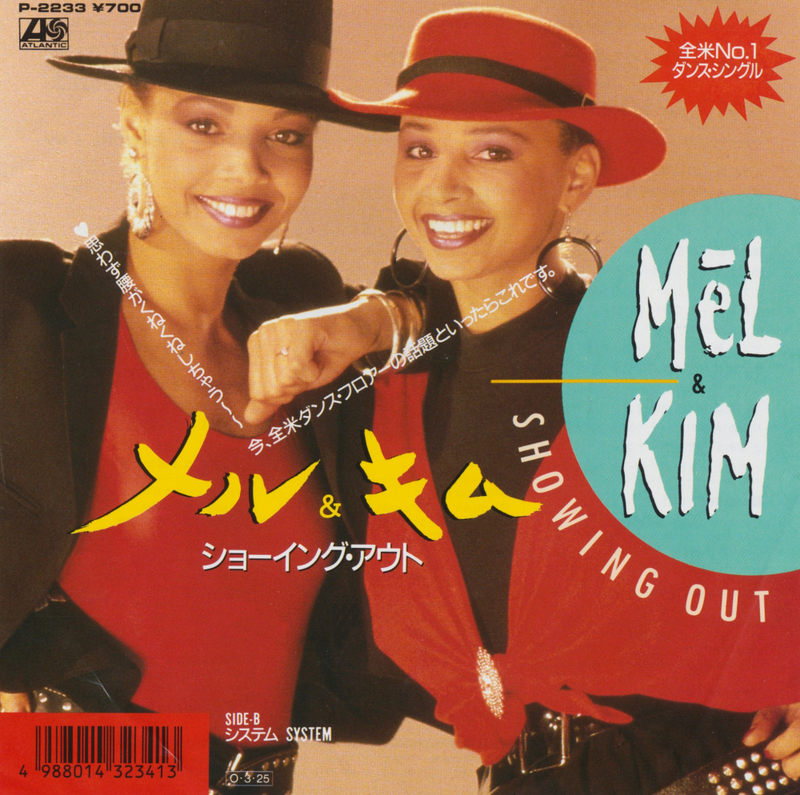 Released in January 1989, it fared slightly better than its predecessor, but still didn't manage to get into the UK singles top 40. The band released two more singles before packing it in. Claudia Brücken and Thomas Leer formed Act after Brücken left her previous band Propaganda. 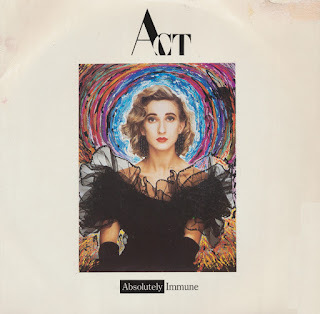 'Absolutely immune' was released as the couple's second single, after the hit single Snobbery and decay. This single didn't reach the chart, unfortunately. 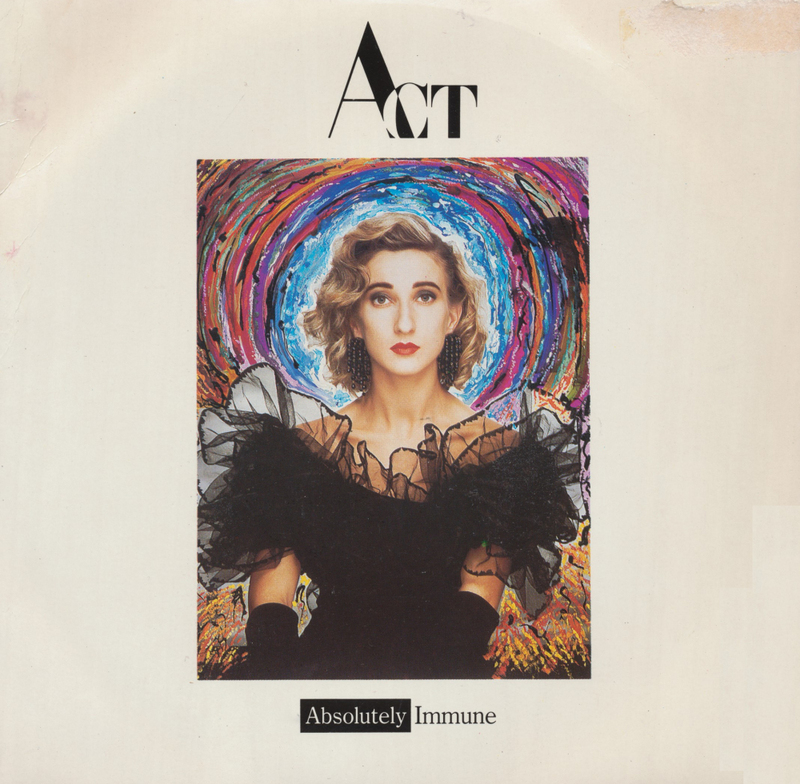 It is a pity that Act broke up after the release of their debut album. 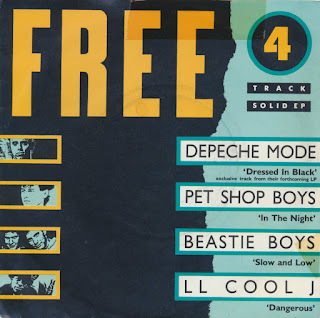 Judging from the contents of this single, they could have released much more interesting tracks. 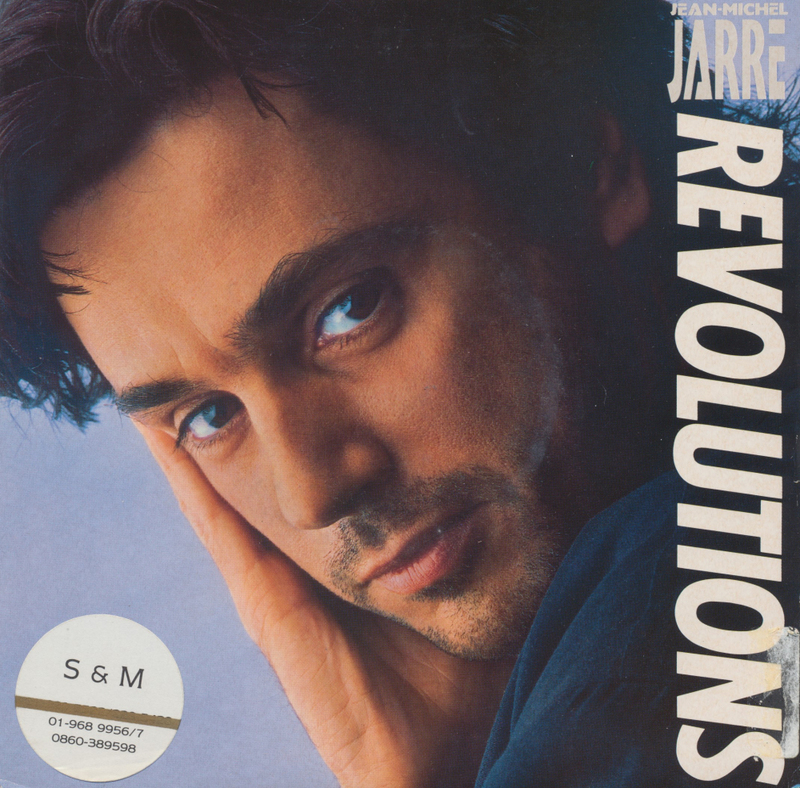 This single presents an edited version of the album's title track, backed with the entire 'part 2' of 'Industrial revolution' as it appears on the album. As one half of the duo Wham!, Andrew Ridgeley has been much maligned after he and George Michael went their separate ways. It was often said that he didn't bring much more to the duo than his looks. History has shown that there was more to the story than that - without Andrew, George might never have become the pop star he became. When you listen to this single, you may understand where all the criticism came from. 'Shake' really isn't a very good song and Andrew's vocals sound too lightweight for what should sound like a rough, tough track. I bought the single out of curiosity, although I did vaguely remember what it sounded like - but the poster sleeve was too nice to resist. 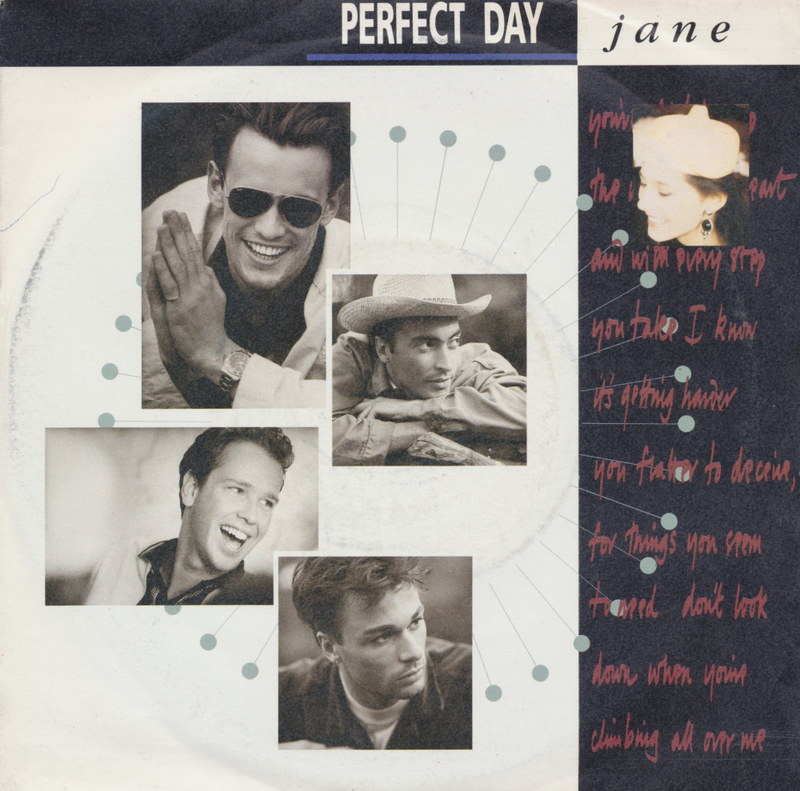 In the mid-Eighties, Perfect Day was formed by Mark Jones (vocals), Kevin Howard (guitar), Andy Wood (bass) and Mark Stott (drums). 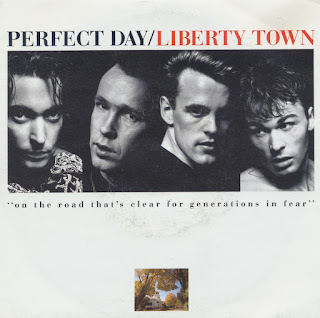 After recording a demo they were picked up by London Records in 1987. They released their debut single 'Jane' in the summer of 1988. The track was produced by Christopher Neil, with additional production and remix by Ricky Wilde. This is, of course, why I became interested in this particular release. The single was not a chart success, but the band did manage to get a small fan following quite quickly. A fanclub was even formed before they ever made a chart appearance, which is an interesting feat for any band. Personally, I think it's one of the band's more interesting single releases. With all the percussion going on, it's a very amusing track to listen to. Which is why I was glad to find this promotional 7" single. It features the (regular) 'long version' and a (rare) 'short version'. Basically, the short version just fades out half a minute earlier, but still, it's a nice find. 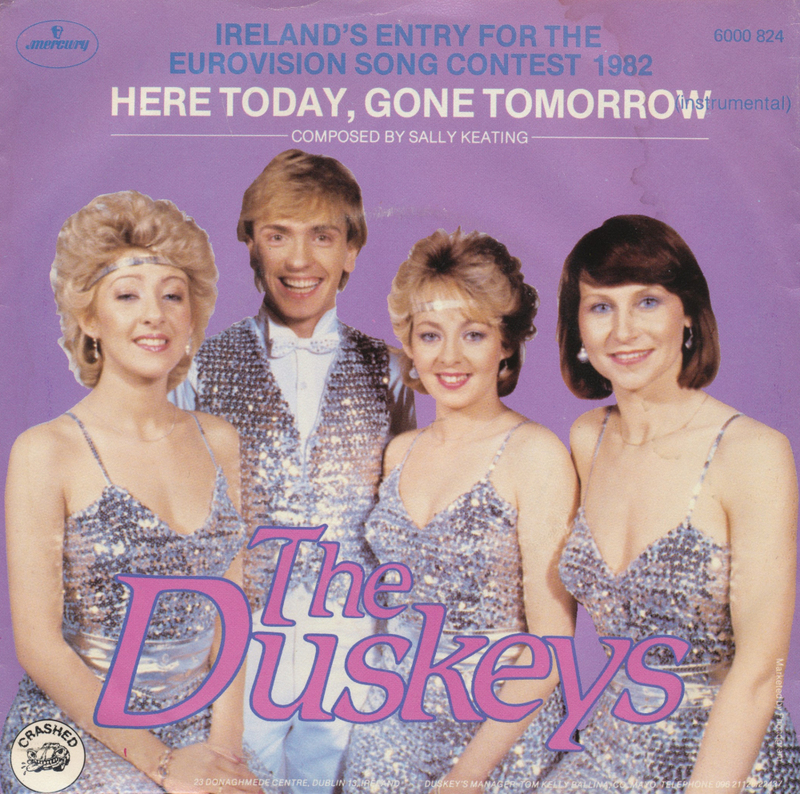 The Irish family pop group The Duskeys represented Ireland at the 1982 Eurovision Song Contest. Formed after the break-up of Sandy Kelly's (real name Philomena Ellis) touring showband The Fairways, she recruited her sister Barbara Ellis and Welsh cousin Nina Duskey. In 1980, they released their debut single, 'Don't feel like dancing'. In 1981 they competed in the Irish national finals for the 1981 Eurovision Song Contest with the song 'Where does that love come from' under the name The Duskey Sisters. They finished in third place. A year later, they tried again and recruited a male member in the shape of Nina's brother, Dan Duskey. Their song 'Here today gone tomorrow' won the national finals, and so they competed on the Eurovision stage. They ended up in eleventh place. 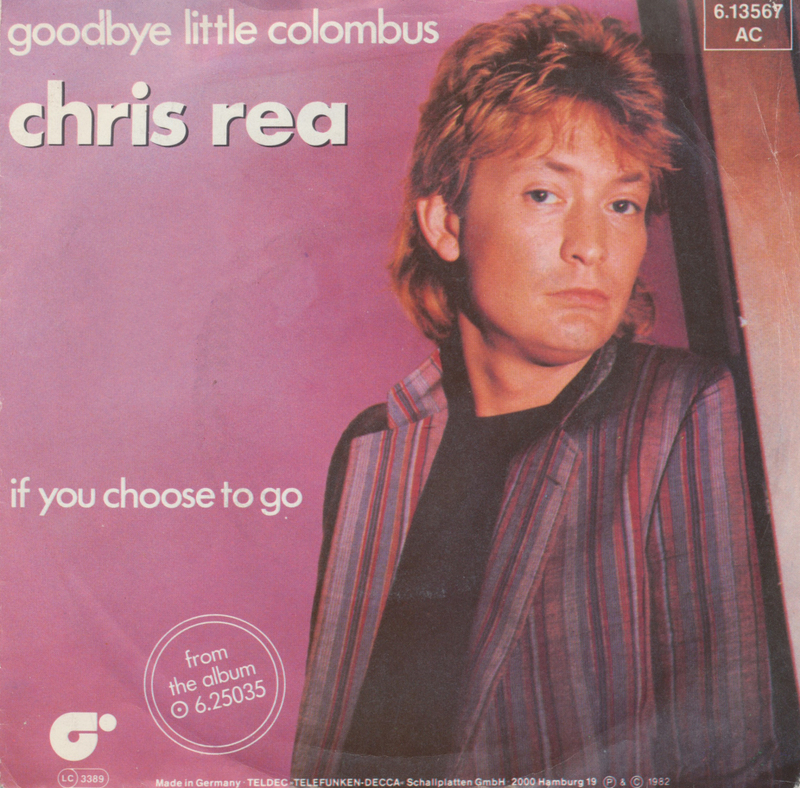 The song was heavily reworked for its single release and became a hit on the Irish charts, reaching number 12. Lotta Engberg was born on March 5, 1963 and represented her country Sweden in 1987 with the song 'Boogaloo'. The song was originally called '4 bugg & en coca cola', but international advertising rules meant that the name of the song had to be changed. The song was a hit in Sweden and peaked at number 19, and it ended up in twelfth place in Eurovision, in a field of 22 competitors. She appeared in national finals for Eurovision in 1984, 1988, 1990, 1996, 2002 and 2012, but failed to return to the international Eurovision stage. Together with her husband Anders she formed Lotta & Anders Engbergs orkester in 1989. 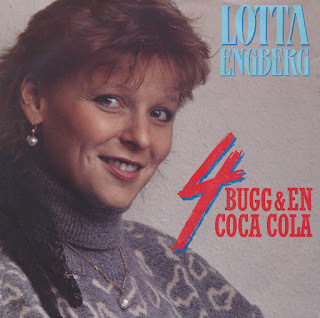 Lotta left the band five years later to form her own Lotta Engbergs orkester. This band fell apart in 2002. Lotta has also been a successful TV host, presenting Lotta på Liseberg and Bingolotto on Swedish television. You wouldn't be far off the mark if you associated the letter M with that one hit single, Popmuzik, from 1979. Personally I always preferred Moonlight and muzak, a track taken from the same album 'New York London Paris Munich', but that's as far as the general public's recall of Robin Scott's work goes. After three albums M was dropped by his label. At this point Robin Scott signed to Stiff Records and released the single 'Danube', featuring his girlfriend Brigit Novik on vocals. 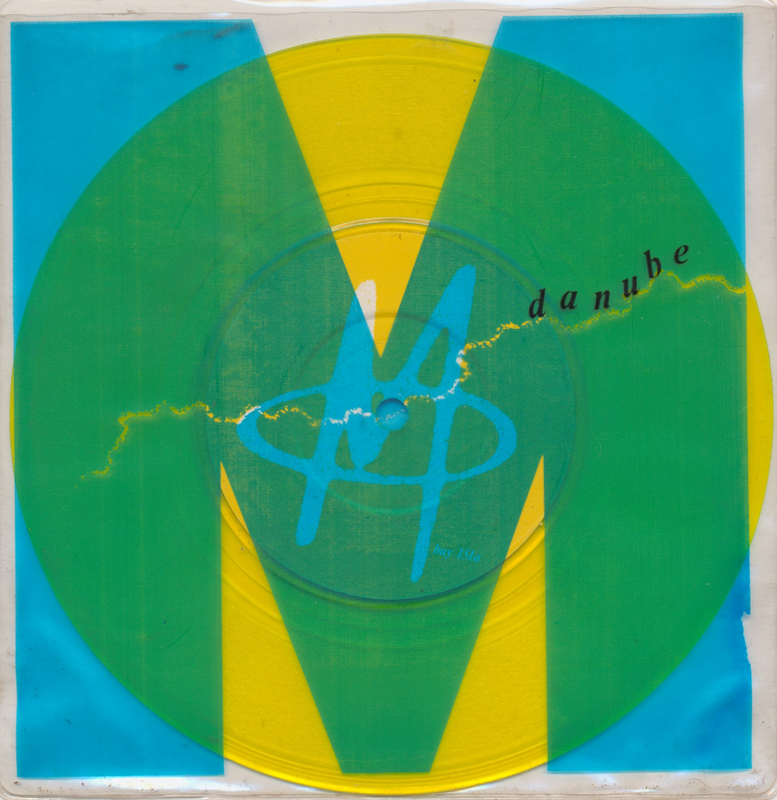 The single was released on yellow vinyl with a transparent sleeve on which a blue M was printed. With the single in it, this M turned green in parts - what a nice effect. High marks for the novelty effect! 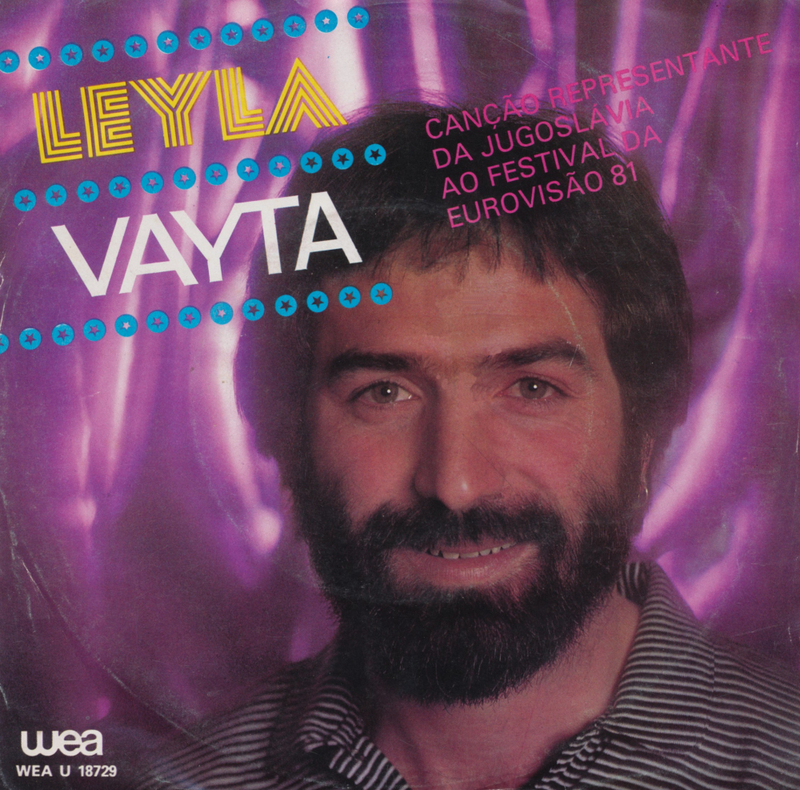 Vayta was born as Seid Memić on March 8, 1950. He was the vocalist for the Yugoslav rock band Teška Industrija between 1975 and 1979. In 1981, he was selected to represent Yugoslavia with the song 'Leyla'. The song ended up in 15th place in a field of 20 competitors, despite its noticeable dramatic qualities. This single is a Portuguese copy, which isn't surprising because it came from a Portuguese seller from whom I ordered quite a few singles. Vayta went on to present a children's programme throughout the Eighties. In 2007, Teška Industrija reunited and released a new album, 'Kantina'. They continued to released new albums, their most recent being 'Selfie' (2016). People who know me, know that any activities involving sports or anything associated with sports turn me off big time. 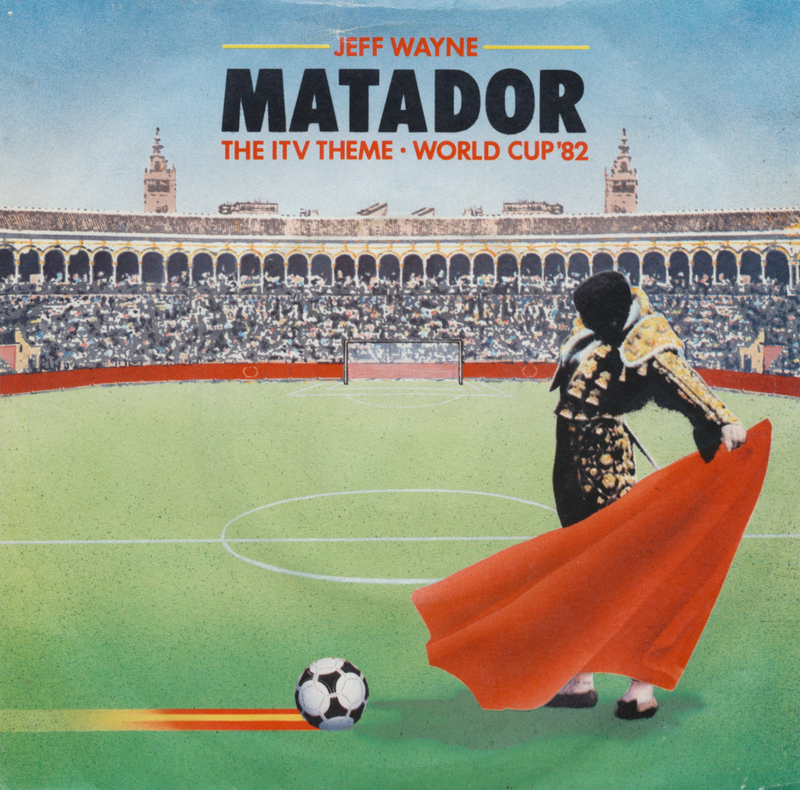 So it's quite ironic that I should buy this single - a theme tune for the 1982 World Cup. 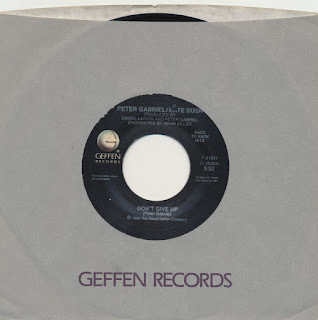 In my defence: this is a Jeff Wayne single and since I am slightly obsessed with Jeff Wayne this single qualified as a nice-to-have in my book. It was one of Jeff's first single releases since the very successful 'War of the worlds' campaign and it is an interesting instrumental piece. The B-side is named 'Henry Higgins', presumably titled after the English bullfighter who lived between 1944 and 1978. 'Matador' reached number 57 in the UK singles charts in the summer of 1982. It should be no surprise that I love Kate Bush's music, just look at my collection of Kate Bush records on this blog. I also like cover versions, so any cover version of Kate Bush songs will catch my attention. The problem is: some are good, others can be very bad. 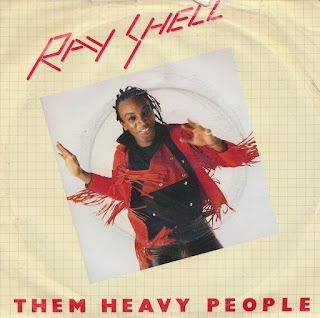 I'm not really sure in which category Ray Shell's disco version of 'Them heavy people' should belong. It's innocent fun, but could also be considered sacrilege. 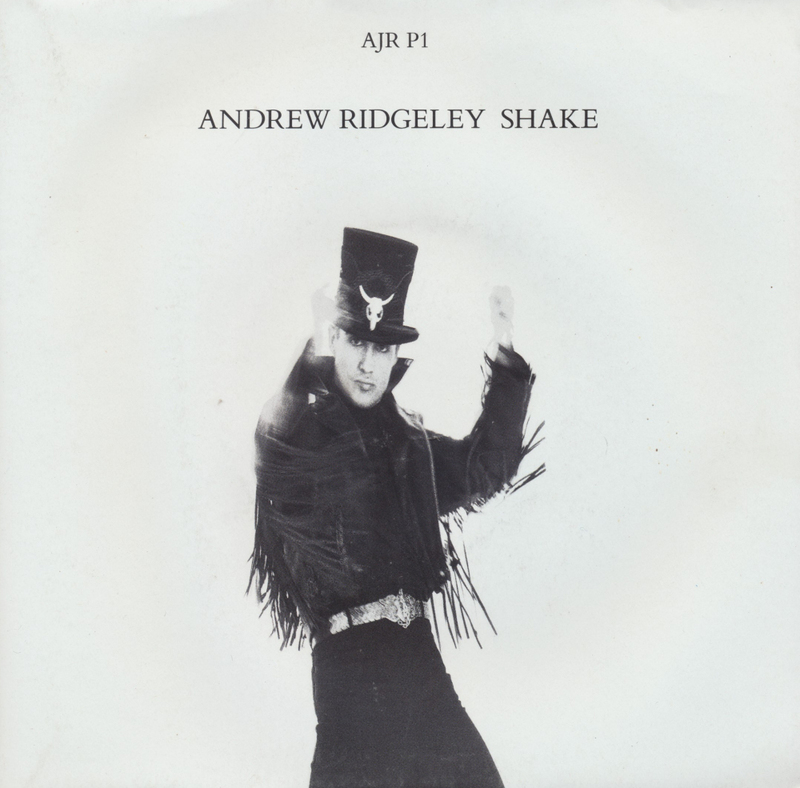 It's quite weird to sing about whirling dervishes on the disco handclap beat in this track. But for some reason, it does tickle me in a pleasant way. The fact that I've searched for this single a long time (it is usually much too expensive) makes the relief that I finally own it now that much bigger. 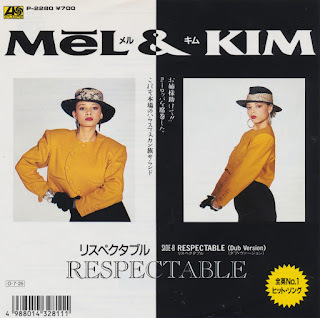 When I bought the Japanese single of 'Showing out', the same online dealer also offered the Japanese single of 'Respectable'. And these are the only two 7" singles from Mel & Kim ever released in Japan, so that makes a complete collection in this case. 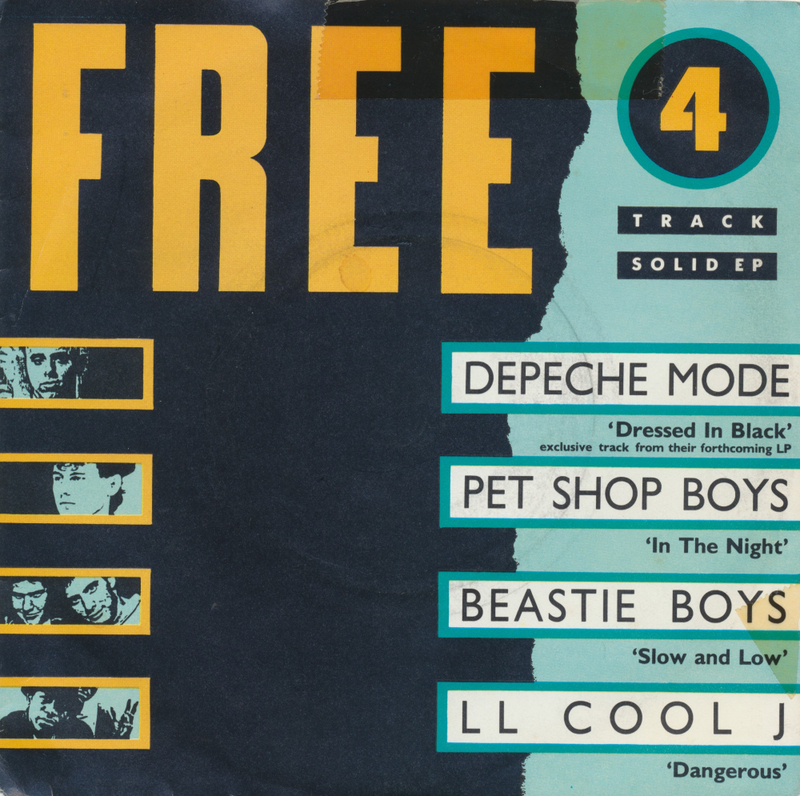 Interesting on this release is the mention of the 'dub mix' on the B-side. It is actually the very same track that is listed as 'instrumental' on the European releases of this single. 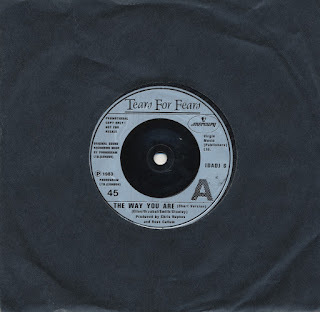 This single has been featured on this blog a few times before, both as a 7" single and as a 12" single (oh, and another 12" single). 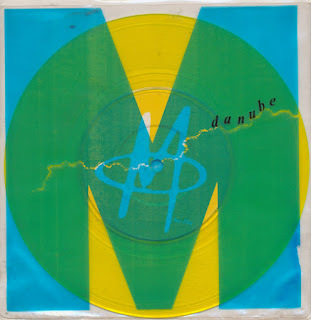 This Japanese 7" single is an interesting one, because it features the album version of 'Showing out', whereas the European versions had an edited single version. Japanese singles are always interesting, of course, because the Japanese make a special package of every single: a record company sleeve with the disc in it comes with a special inlay that often features the song lyrics in English and Japanese and sometimes an extra photograph - and then there's the picture front which in this case is different from the European ones. The fact that I got this single for a low price also helped, of course. 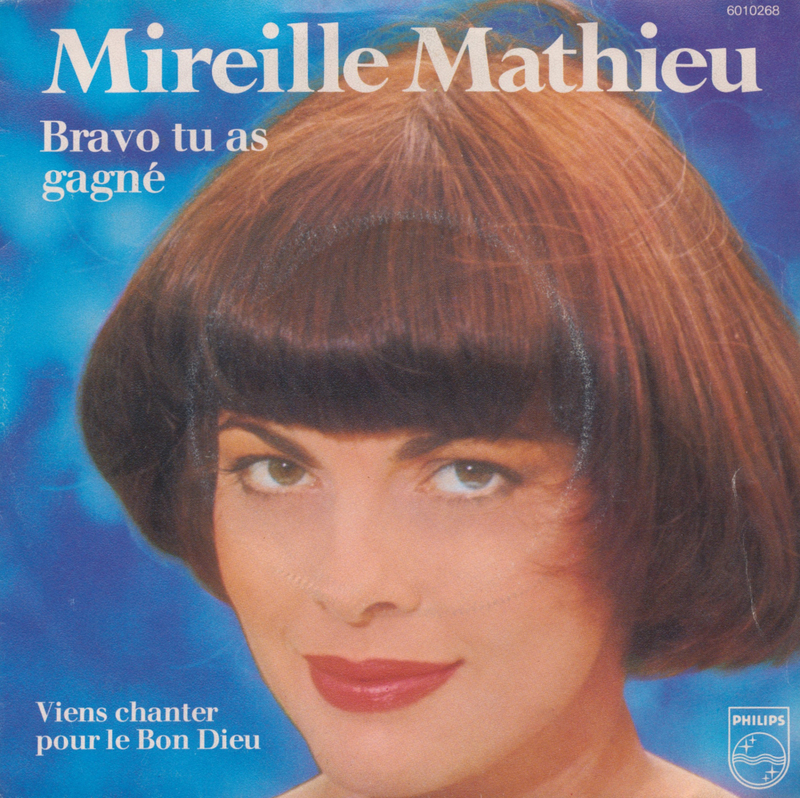 I have very few 12" singles of Eurovision entries. Not that many have been made, an some of the ones that have been made are overly expensive. But every once in a while I come across one for a reasonable price - and then of course I have to have it. 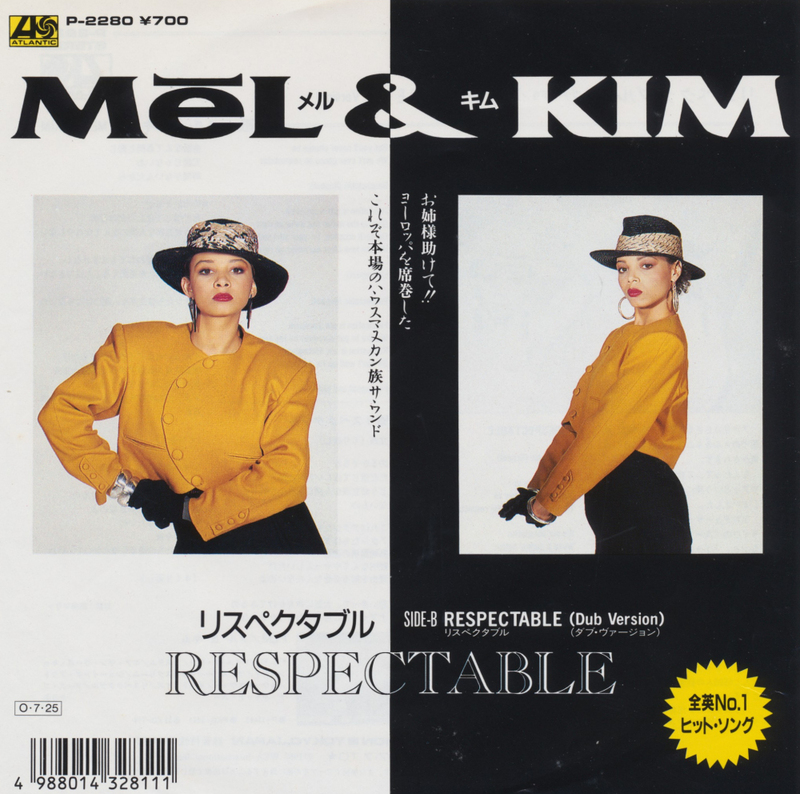 Especially since the remixes on such 12" singles are very rare, because they have rarely been released on CD in later years. A good example is my most recent acquisition: Vikki represented the UK with 'Love is' in 1985. 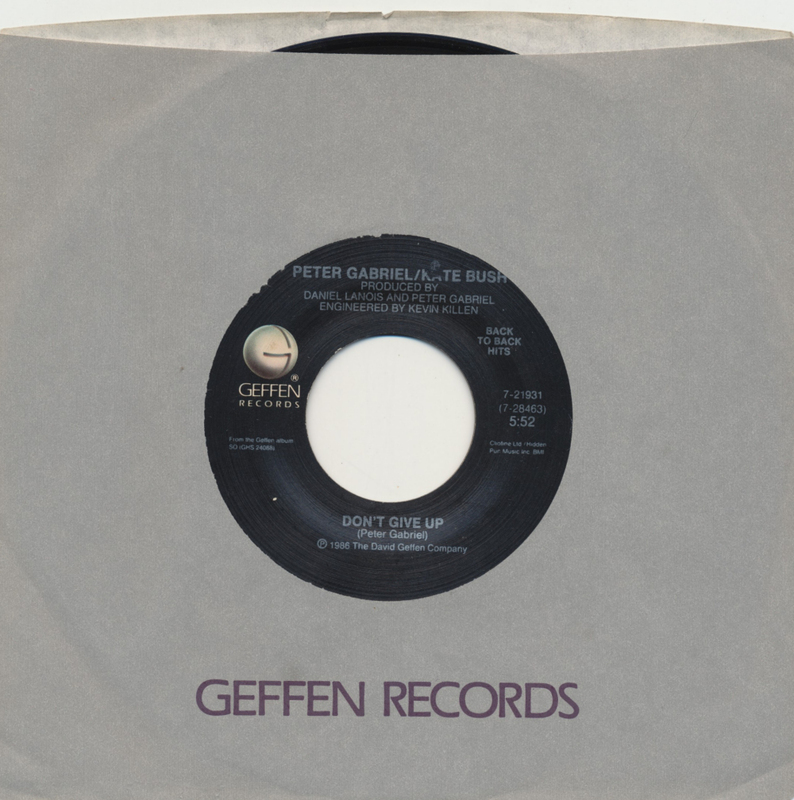 The 12" single features a special remix. Clocking in at 4 minutes and 23 seconds, it's not very much longer than the original verison but still a different take on this slightly cheesy song. U2 is an undeniably popular band, and so I am surprised that somehow I always get hold of these double packs. 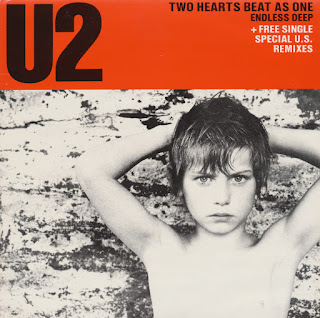 The unforgettable fire was produced in large quantities, but Pride (In the name of love) was a rather more limited edition, and this 'Two hearts beat as one' double pack is probably even rarer. I'm not really a U2 fan, but I love limited editions like this and a remix of 'New years day' was just too delicious to pass up on. It's one of my favourite U2 tracks, and the intro of this remix is beautiful. The US remixes were created by François Kevorkian. 'Two hearts beat as one' reached number 18 in the UK singles chart and number 2 in Ireland.